Sands Of Time: Beach Etiquette Of Long Ago : NPR History Dept. Summertime and the living has not always been so easy on some American beaches. For shore. A "beach cop" measures bathing suits in Washington, D.C., in 1922. Seaside, riverside and lakeshore beaches in America today are democratic scenes — level playing fields for folks of all stripes. Not so in summers past. Time was, certain beaches in America were off limits to people of color. 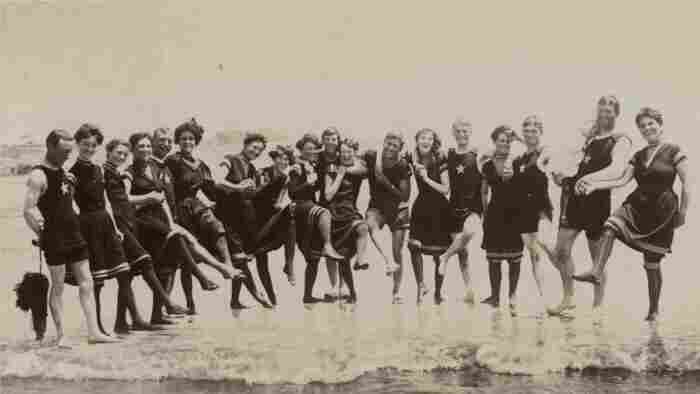 Some beachgoers publicly objected to women and men bathing together. And there were conventional rules — written and unwritten — that dictated behavior for bathers everywhere. Bathers at the beach, 1906. "Don't sit in the sand in a wet bathing suit with a man similarly attired." "Don't encourage men to loiter outside your bathing house waiting for your reappearance." "Don't go into a café after your bath and take a cocktail." "Don't bathe with strange men; the etiquette of introduction is just as strict in the water as in the drawing room." As evidence of the last rule listed above: A schoolteacher — in distress while swimming just off the beach in Santa Cruz, Calif., in the summer of 1913 — called out for help. A salesman hurried to her aid and helped her to the shore. He gave her his business card. "For his reward," according to a squib in the Hopkinsville Kentuckian on July 26, "the hero received a note in which the lady told him that he should not regard the rescue act as a sufficient reason for an introduction." There were also definite no-no's for swimming attire. 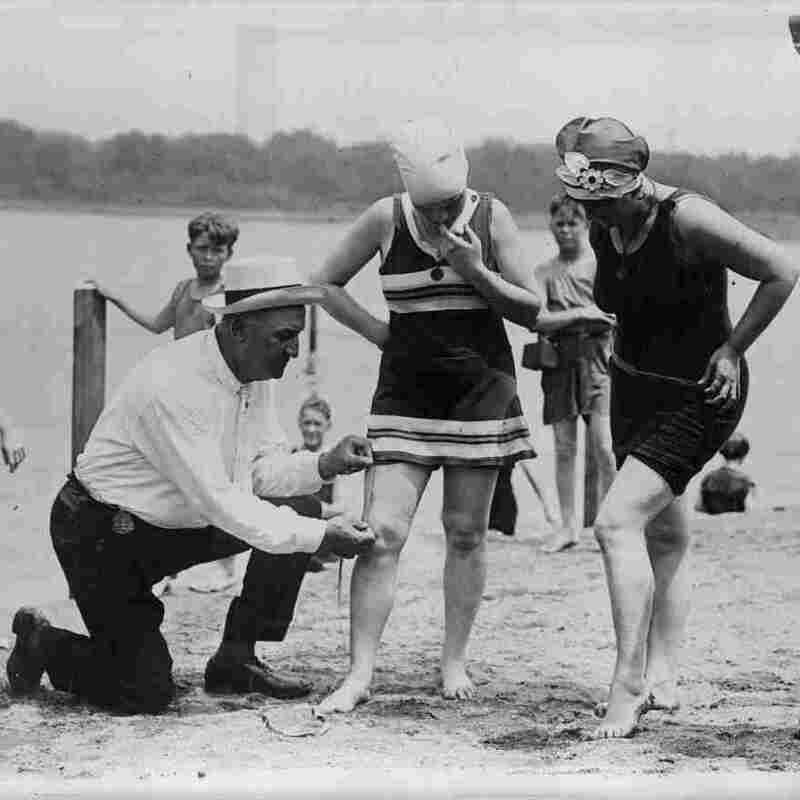 In the summer of 1922, according to information accompanying a photo at the Library of Congress, the city of Washington, D.C., decreed that a woman's bathing suit was not to be more than six inches above her knees. Rules varied from beach to beach. The public safety director of Atlantic City., N.J., also declared in 1931 that "suits must not be shorter than six inches above the knee" and "trunks must not be too tight," according to the Mount Carmel Item in Pennsylvania on June 5. At a lakeshore spot in Decatur, Ill., all male swimmers — in the summer of 1933 — had to wear shirts and no one was allowed to hang clothes on a hickory tree, the Daily Review reported on June 9. But as the 1930s wore on, restrictions on swimwear began to wear off. Stories about beaches posting dress — or undress — codes seemingly disappear from newspapers. By 1939, the city of Hammond, Ind. — apparently reflecting the relaxing attitudes of many American towns — had thrown all bathing suit rules out the window. "The city will establish no rules on type of bathing suits to be worn," the local Times reported on June 16, "just so bathers are garbed in some fashion."